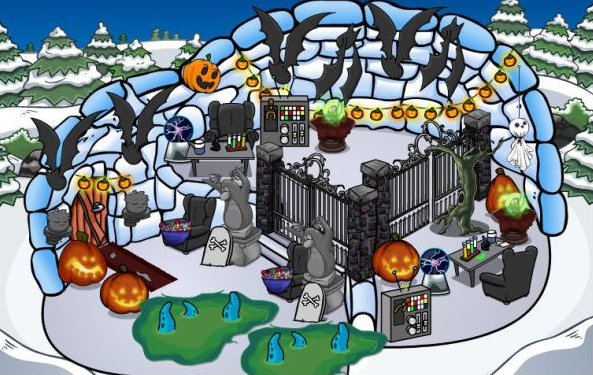 Club Penguin Cheats by Mimo777 Club Penguin Cheats by Mimo777: Club Penguin's Halloween Party Don't Miss List! Haunted Mansion: All penguins can visit the Haunted Mansion at the party! The ghost costume is available inside the Haunted Mansion, so don't forget to pick that up. Night of the Living Sled Live: Make sure you check out the newest play at the Stage, where you can find a few extra Halloween costumes, like the new Sled costume! Have you seen and done all this awesomeness? If not, dood, you need to! There isn't preparations, it's ALREADY there! To get the hat, click on the dart above the arrow to the book room and it will be by the table! how do you get the trick or treat stamp? What igloos are u supposed to visit?